The way the majority of Schinkel's drawings and prints were formerly stored dated back to the origins of the Schinkel Museum, which was founded shortly after Schinkel's death in 1841. The storage methods applied at that time posed a threat to this significant collection, leading to chemical as well as mechanical damages. For this reason, one main focus of the Schinkel project was placed on the preventive preservation of Schinkel's works, and especially the development and execution of a comprehensive concept for the careful, sustainable rehousing of Schinkel´s works. The Kupferstichkabinett’s Schinkel collection is characterised stylistically, thematically and moreover regarding the variety of the artistic materials by its immense diversity, and thus placed complex demands on a new storage system. 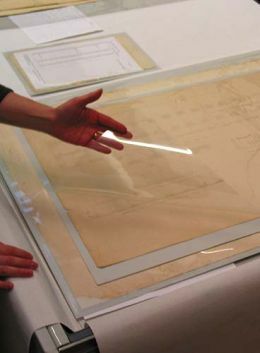 Small, detailed drawings executed during his travels and sketchbooks go side by side with large-size, cumbersome architectural plans and views (with format widths of up to 175 cm). The variety of papers used by Schinkel ranges from traditional types of hand-made laid paper, made out of textiles and extremely fine transparent paper impregnated with linseed oil to early machine-made wove paper. The drawing and painting materials used by Schinkel - and therefore their risk potential - are just as diverse. They include, for example, iron gall ink, causing ink corrosion, gouaches with a low binder content which are at risk of abrasion, and powdery charcoal drawings which adhere only weakly to the paper. The historic housing of Schinkel's drawings and prints largely dates back to the origins of the Schinkel Museum which had been founded shortly after Schinkel's death in 1841. Between 1842 and 1848, bookbinder C. Pietzker was instructed to, "trim and mount the drawings to boards", i.e. to adhere them to larger-format cardboards. 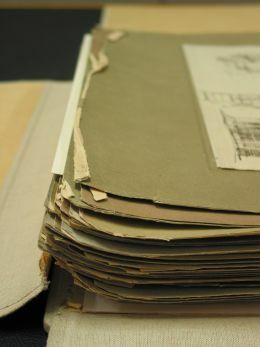 The mounted drawings were stacked in small piles and placed in stable portfolios with fold-down cover flaps. These measures had been taken with the well-meaning intention of storing the drawings in a careful manner and protecting them against damage inflicted by handling. 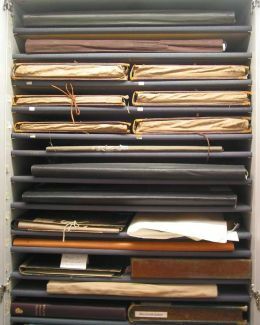 Unfortunately, this way of storage , which is of significant historical interest resulted in considerable damage to the sensitive drawings, which is already mentioned in the Schinkel Museum's early archival documents: the fact that the objects were piled directly on top of each other caused surface abrasion, both to the paper itself and to the drawing and painting materials, with the watercolours and gouaches suffering the most damage. Measures to improve the storage situation of this important collection had been proposed and implemented repeatedly in the past. Nevertheless, the sheer size of the collection was presumably one of the reasons why it was never systematically and completely revised or stored in a more sustainable manner. An exceptional storage-related problem lied in the emission of volatile organic compounds by the objects themselves, the mounting boards, the historical portfolios and even the storage cabinets. Within the context of the Schinkel project, the Kupferstichkabinett collaborated with research institutes (Universität für Bodenkultur, Wien (University of Natural Resources and Applied Life Sciences, Vienna); Staatliche Akademie der Bildenden Künste, Stuttgart (Stuttgart State Academy of Art and Design); Rathgen-Forschungslabor der Staatlichen Museen zu Berlin (Rathgen Research Laboratory, Berlin)) to detect the emission of possibly harmful gases using scientific examination methods and to identify emission sources. The physical and chemical interaction between paper and the VOCs were analysed in detial in order to determine the potential damage caused by the emission sources on the works on paper. The results will be used to develop methods for reducing gaseous pollutants in closed containers. One possibility of fighting the destructive effects draws upon contaminant adsorbers, which are integrated into portfolios, boxes or storage cabinets, eliminate damaging volatile compounds and thus prevent chemical reactions with the original objects. 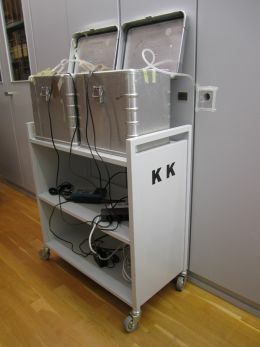 The analysis of the study results lead to the creation of an innovative storage system which fulfils the prerequisites posed by the artworks' long-term preservation, simultaneously complying with the museum's requirements with regards to space-saving storage, economic execution and easy handling. Additionally, the improved storage system can be transferred to other museums who are facing comparable challenges regarding the storage and conservation of their collections.